Start your Hammock journey! Learn gorgeous poses and basic inverts. 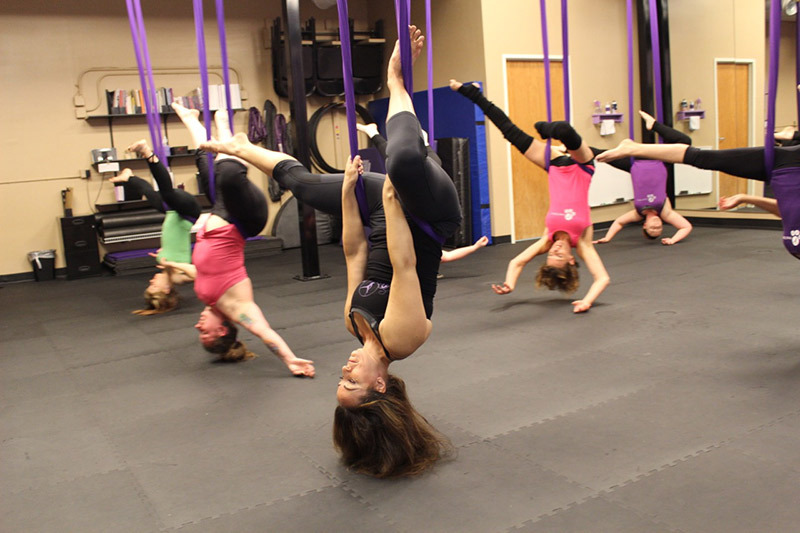 Improve your flexibility, balance and upper body strength while wrapping yourself between the strands of an aerial hammock. Fill out a card with all the moves you’re learning to track your progress. No Prerequisites! No prior experience needed! Open to all adventurous women! Come Fly! You can sign up for Beginner Hammock without taking an Intro class. Take that Intro class if you’re not sure what apparatus you want to take an hour class on. Class will start with a warm-up and will include strength building exercises. Then you’ll learn a few tricks and string them together for an in-air sequence. You’ll do some conditioning exercises that are FUN and specific to Hammock tricks. Then you will learn more tricks that create a second sequence. The class will end with stretching, time in your “bat cave” and rolling out your forearms with a ball. The hour class will FLY by! When you attend your first Hammock class you will be given a card that has all the moves in the Beginner Hammock program listed. At every Beginner Hammock class or practice you attend you will write the date if a move was “introduced” or when you feel “proficient” in the move. “Proficient” means that you know what the move is and can execute it comfortably. We don’t expect it to be perfect to be proficient, just really comfortable. Once 90% of your Beginner Hammock card is “proficient” you can ask the instructor to clear you for Intermediate Hammock! Everyone has their own Hammock so that maximum class size is 10.